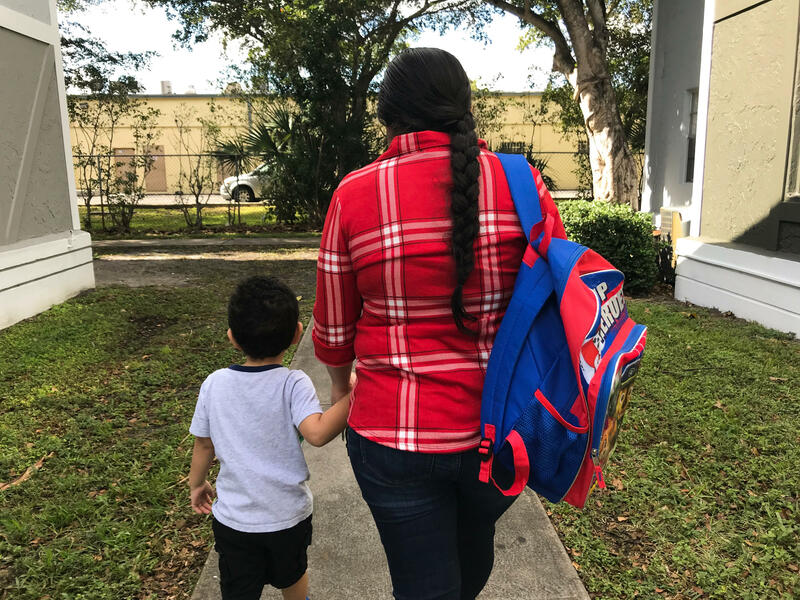 This young woman and her son fled Nicaragua in 2016 to get away from the boy's abusive father. They're living in South Florida while she seeks asylum. We're not using the woman's name because her parents are undocumented, and she's asking for asylum and hopes to stay in the U.S. She fled Nicaragua with her infant son to get away from the boy's abusive father. Finally, in Florida, she felt like she had escaped his grasp. "I was far away," she said. "I felt safe here." But she may not be safe in the U.S. for long. The young woman arrived at a moment when immigration is paralyzing American politics. The President wants to build a wall on the southern border, and keep asylum-seekers on the other side of it. Almost a month into the partial government shutdown, there's still no agreement on the wall. But another effort to stop the flow of migrants is taking hold. The number of asylum claims denied by immigration judges increased to nearly 70 percent last year, after the Justice Department made it harder for victims of domestic abuse and gang violence to get asylum. The young woman from Nicaragua has the dubious distinction of being one of the first migrants to be denied asylum under a June 2018 ruling from then-Attorney General Jeff Sessions in a case known as "Matter of A-B-." "I feel in my heart that had this case been before 'Matter of A-B-,' we would have had a different outcome," said Evelyn Colón, the Nicaraguan woman's lawyer. Colón points to a stack of legal filings more than five inches high, detailing the years of sexual and physical abuse her client described to her. Had the woman's asylum hearing been held earlier — even a few weeks earlier — Colón thinks she would've had a good chance of getting asylum. But now, Colón says some immigration judges have begun denying all asylum claims based on domestic violence. Attorney Evelyn Colón represents the Nicaraguan woman in immigration court. "I don't think they take the time to listen to the client, even in the hearing," Colón said. "They just have their script." In her hearing last June, the Nicaraguan woman told an immigration judge in Miami that her boyfriend got increasingly violent after she got pregnant. One day, she says, he showed up drunk and started banging on the door. "I was scared because he was screaming very loud," she said. "And he was banging on the door, saying 'open it, you are my woman, you have to open.' He kicked the door so many times that the door fell." The woman says her boyfriend raped her that night. She was seven months pregnant at the time. She believes that's why her son was born prematurely a month later. In his ruling, immigration judge Michael C. Horn wrote that he was "very sympathetic to the plight of the individual in this case," and that he found her story to be credible. Still, he denied her request for asylum, citing "Matter of A-B-" multiple times in his decision. Former immigration judge Mark Metcalf knows how gut-wrenching these cases can be. "It's a very difficult analysis," said Metcalf, who served as an immigration judge in Miami and is now a county prosecutor in Kentucky. "It is not easy for the judges. I've been there, I know. It's not easy to say no to people." In order to get asylum in the U.S., you have to show that you've been persecuted because of your race, religion or other characteristics. And Metcalf says just being the victim of a crime doesn't qualify. "I've had to look a person in the eye and tell them I believe you were telling me the truth," Metcalf said. "I just don't believe your claim is rewarded with asylum." After the decision from Sessions in "Matter of A-B-" last year, the number of asylum denials issued by immigration judges jumped in the second half of 2018, according to the TRAC Immigration project at Syracuse University. The number of asylum cases granted was up too, but denials grew even faster. Immigration judges of now reject nearly 70 percent of asylum claims, up from less than 60 percent when President Trump took office. Immigration judges are part of the Justice Department, which is trying to speed up the pace of immigration courts in the face of a massive backlog. The Trump administration has hired more immigration judges, and pushed them to decide cases faster. "We've seen a huge increase in the number of immigration judges," said Andrew Arthur, a former immigration judge in Pennsylvania who is now a resident fellow at the Center for Immigration Studies, which favors lower levels of immigration. In fiscal 2018, the administration hired 81 new immigration judges — more than 20 percent of the total number, according to the Executive Office for Immigration Review. Arthur thinks that hiring spree is the biggest reason for the jump in asylum decisions and denials. But he says the "Matter of A-B-" ruling may also be a factor. And Arthur praised the Trump administration for trying to close what immigration hardliners consider "loopholes" in U.S. immigration law. He says immigration courts have been flooded in recent years with claims based on gang violence and domestic abuse that should not qualify for asylum. "These things are reprehensible," Arthur said. "But unfortunately, they're not a basis for asylum relief in the United States." A loophole, or a basis for asylum? But many immigration lawyers disagree. They say some migrants fleeing gangs and domestic violence should qualify for asylum, because their own governments did nothing to protect them. They argue that these migrants should be considered members of a "particular social group," one of the protected categories in U.S. and international asylum law. That's why the woman from Nicaragua should be allowed to stay here, argues Karen Musalo, the founding director of the Center for Gender & Refugee Studies at U.C. Hastings College of the Law in San Francisco. "She suffered horrendous abuse, she went to the police, really to no avail. And tried to escape him," Musalo said. "And that's really the classic facts of a case that should have been granted." On a recent morning, the Nicaraguan woman picked up her son from a neighbor's apartment. He's 3 years old now, an outgoing little kid with a Paw Patrol backpack. After he was born, she says, her boyfriend started to hit him, too. "That's when I decided to go the police," she said. But the police in Nicaragua never arrested the boyfriend, or even talked to him, she said. When he found out she'd filed the complaint, her boyfriend was furious. "He told me that I was never going to leave him," she said. "That I was going to be with him forever, because I was his property." That's when she took her son and fled to the U.S. She's now appealing the judge's decision in her asylum case. I asked what she'll do if she loses the appeal. She said she doesn't know, but she can't go back to Nicaragua. Now, the government shutdown began with President Trump vowing to stop Central American migrants with a wall along the southern border. And almost a month later, there is still no agreement on that wall. But another effort to stop the flow of migrants is taking hold. Judges are increasingly denying them asylum under a new administration policy. NPR's Joel Rose has this report on one woman's case. And just a warning - some parts of her story are disturbing. 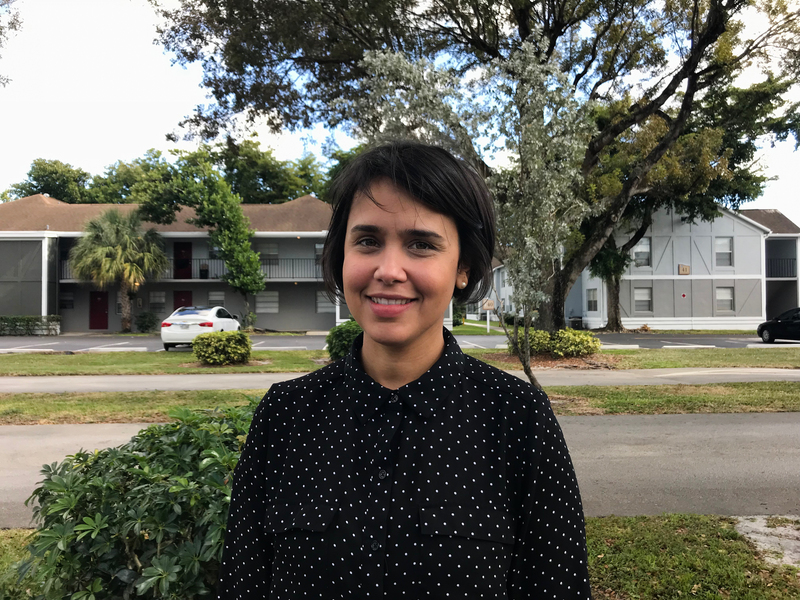 JOEL ROSE, BYLINE: When the young woman from Nicaragua got off the plane in South Florida, she hadn't seen her parents in more than a decade. She says they looked exactly like they did when they left their tiny Central American town to find work in the U.S. Her eyes light up as she describes their reunion at the airport. UNIDENTIFIED PERSON: (Through interpreter) When I saw them, I ran to hug them. I felt a huge joy when I saw them again. And I knew that I was going to be here protected. ROSE: We're not using the woman's name because her parents are undocumented, and she's trying to get asylum and stay in the U.S. She fled Nicaragua with her infant son to get away from the boy's abusive father. Finally in Florida, she felt like she had escaped his grasp. UNIDENTIFIED PERSON: (Through interpreter) I felt safe here. I was far away. ROSE: But she may not be allowed to stay in the U.S. for long. The young woman arrived at a moment when immigration is paralyzing American politics. The president wants to build a wall on the U.S.-Mexico border and keep asylum-seekers on the other side of it. The young woman from Nicaragua has the dubious distinction of being one of the first to be denied asylum under a new Trump administration policy. Evelyn Colon (ph) is her lawyer. ROSE: Colon shows me a stack of papers more than 5 inches high. The file details years of sexual and physical abuse her client described to her. Had this woman's asylum hearing been held earlier by even a few weeks, Colon thinks she would have won. COLON: I feel in my heart that had this case been before Matter of A-B-, we would have had a different outcome, even days before A-B-. ROSE: What she's talking about here is a court ruling known as Matter of A-B-. It was issued last June by then-Attorney General Jeff Sessions, who oversees immigration judges. It says, in most cases, migrants fleeing from domestic abuse or gang violence do not qualify for asylum. But Colon says some judges have begun denying all domestic violence cases. COLON: I don't think they take the time to listen to the client, even in the hearing. They just have their script. ROSE: In her hearing last June, the Nicaraguan woman told her immigration judge that her boyfriend got increasingly violent after she got pregnant. One day, she says, he showed up drunk and started banging on the door. UNIDENTIFIED PERSON: (Through interpreter) I was scared because he was screaming very loud, and he was banging on the door saying, open it. You're my woman. You have to open. He kicked the door so many times that the door fell. ROSE: The woman says her boyfriend raped her that night. She was seven months pregnant. She believes that's why her son was born prematurely a month later. Her immigration judge said he found her to be very sympathetic. Still, he denied her request for asylum, citing the new ruling from Jeff Sessions. Mark Metcalf knows how gut-wrenching these cases can be. He used to be an immigration judge in Miami. MARK METCALF: It's a very difficult analysis. It is not easy for the judges. I've been there. I know. It's not easy to say no to people. ROSE: In order to get asylum in the U.S., you have to show that you've been persecuted because of your race, religion or other characteristics. And Metcalf, who is now a prosecutor in Kentucky, says just being the victim of a crime doesn't qualify. METCALF: I've had to look a person in the eye and tell them I believe you were telling me the truth. I just don't believe your claim is rewarded with asylum based on the facts that you've given to me today. ROSE: After the ruling from Sessions last year, judges have increasingly denied asylum claims. Now they reject nearly 70 percent of all claims. But many immigration lawyers say Sessions was wrong. They say some migrants fleeing gangs and domestic violence should get asylum because their own governments did nothing to protect them. That's why the woman from Nicaragua should be allowed to stay here, argues Karen Musalo. She directs the Center for Gender & Refugee Studies in San Francisco. KAREN MUSALO: She suffered horrendous abuse. She went to the police really to no avail and tried to escape him. That's really the classic facts of a case that should have been granted. ROSE: Back in Florida, the Nicaraguan woman picks up her son from a neighbor's apartment. He's 3 years old now, an outgoing little kid with a "Paw Patrol" backpack. Soon after he was born, she says, her boyfriend started to hit him, too. UNIDENTIFIED PERSON: (Through interpreter) That's when I decided to go to the police. ROSE: But the police in Nicaragua never arrested the boyfriend or even talked to him, she says. And the boyfriend, he was furious. UNIDENTIFIED PERSON: (Through interpreter) He told me that I was never going to leave him, that I was going to be with him forever because I was his property. ROSE: That's when she took her son and fled to the U.S. She's appealing the judge's decision in her asylum case. I asked what she'll do if she loses the appeal. She said she doesn't know, but she can't go back to Nicaragua. Joel Rose, NPR News. Transcript provided by NPR, Copyright NPR.